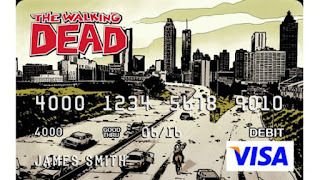 Zombies And Toys: Time to flash a little plastic: Walking Dead style ! 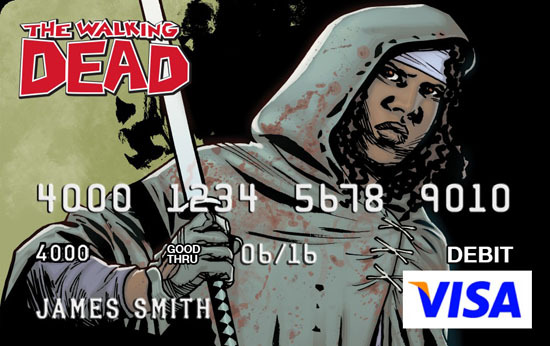 Time to flash a little plastic: Walking Dead style ! Next time you're on that big date with either that girl you want to impress, or if you're footing the bill for one of those fat-cat executive luncheons, do you really wanna reach into your velcro-stripped wallet to pull out a few crumpled bills in order to foot the tab, or would you rather flash the plastic in style with one of the new Walking Dead debit cards ? Image Comics, the titleholder of the comics themselves, along with series artist Charlie Adlard, have released 7 differently themed designs for the bank-approved cards which are available by going to www.card.com/thewalkingdead. Just click on which card you want, fill out all applicable info & VOILA ! 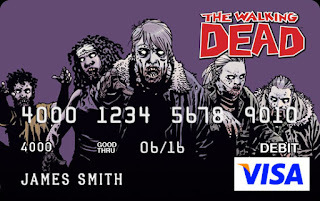 You are now a (debit) card carrying member of The Walking Dead plastic party, but don't go overboard with charging all kinds of stuff - it's one thing to deal with bankers chasing you down.....but an angry group of flesh-hungry zombies ?.....on second thought, I'd rather take my chances with the zombies.